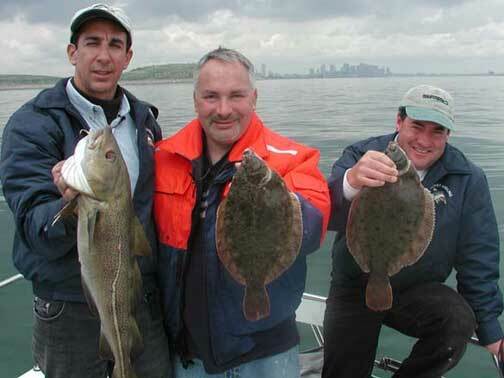 The late May flounder fishing visit to Boston Harbor was a real eye opener. Guest Pete Santini, owner of Fishing Finatics (creator of the Santini Tube Lure), was right on the money when he described the great comeback that the flounder and cod have made in the harbor. Despite sometimes breezy conditions the action never stopped and the guys caught over 30 flounder to 4lbs with several over 2lbs. Nearly every fish was of legal size. They also had cod mixed in up to 10 lbs. At the end of the day, they put the cameras and Flounder gear away and took a short run to a nearby cod spot and jigged up several solid cod up to 40lbs. If you have questions about any of the flounder fishing equipment used during the show, please contact us.